How Has LinkedIn Changed Recruiting in the UK? It’s undeniable that LinkedIn has had a remarkable impact on the way that organisations do business. Over the years it has transformed the way that companies function, from the way they market their brand, to the means they go to to recruit new staff. 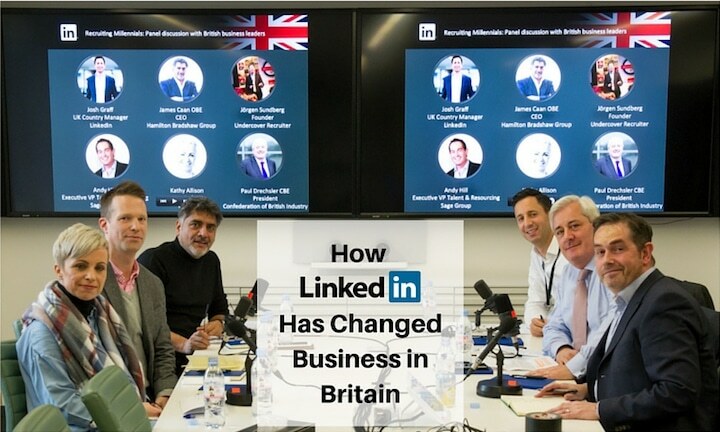 To mark LinkedIn hiting the 20 million UK members mark last month and learn how the professional network has impacted the UK, I’ve had a chat with British business leaders James Caan, Kathy Allison, Paul Dreschler, Andy Hill and Joshua Graff. Listen to the interview on iTunes, SoundCloud or keep reading for a summary. And don’t forget to subscribe to the Employer Branding Podcast. How has LinkedIn changed your business? I think it’s created a fantastic opportunity for us to not only identify and connect with talent. From a recruitment perspective, it helps us in terms of sales and marketing, in terms of accessing the communities, the small businesses that we want to work with. So I think across all it’s product mixes it’s had a fundamental impact both on cost of acquisition of talent, but also in terms of cost of acquisition of customers as well. How do you and your organisation use LinkedIn? I’ve been a user of LinkedIn for many, many years, one of the early adopters. And I personally use it to make connections with people, not only for bringing in talent because that’s my job, but also to sort of establish a network, so I reach out a lot. I do a lot of blogs. I do a lot of postings. I get a lot of information on the latest trends on there on many groups. So I’m an active user. It’s probably up and on my desktop as much as my Outlook to be fair. As an organisation, we use it extensively for recruitments right across the globe for Sage. In marketing, we use it and the tools there. We also have Lynda.com as learning platform, so as head of talent I also have the learning organisation. So we use pretty much all the products. Tell us about your CEO? Yeah, he’s an incredibly sociable CEO [Stephen Kelly]. He got a Power Profile today on the anniversary of this 20 million milestone for LinkedIn. But also, I think for him, he’s incredibly active. I mean, he’s constantly forwarding me profiles of people who’ve contacted him. But also, he actively blogs on there and connects across the whole organisation. But also, he’s encouraged us and supported us in building LinkedIn into our own inductions, so we get all our employees now to…we help them with their professional profiles because we’re quite comfortable with them using it as a tool for their own network and career. What do you think the future holds for LinkedIn? Well, I think they’re going to keep growing at a massive rate. I think their biggest challenge is connecting with the real whole world work. They’re 90% of vacancies which are in small businesses, very small businesses, and that marketplace, and how they can really connect with the small business leader to make sure some of their other products, that side of talent can really add value. It’s a huge opportunity where maybe a lot of work to be done with small business setting. How has LinkedIn changed your business and industry? LinkedIn has made it much easier for us to get our employer brand out there and to contact candidates directly, making them see that we have a brand that they would be interested in. How would you say you use it, and how does your organisation use it? I use it to keep in touch with news, updates, what’s going on. Being part of the relevant groups and increase my own knowledge. Our organisation uses it for recruitment. We use the recruiter tool, but we also use it to share what we’re doing globally and as an employer branding tool as well. What do you think the future is on LinkedIn for FitFlop and for the wider industry? I think the great thing about LinkedIn, is there is always new products, new developments that are coming. So I wouldn’t be able to predict what’s coming next, but I’m sure it’s going to be really relevant. The future for us is wider, engaging within our business and to make it a tool that we use for talent interacting, and sharing what’s great about our business. Not just through our HR and people team, but through all of our leaders and representatives in the business. How do you think LinkedIn has changed business? I’m delighted to have this opportunity to talk to you. Let me tell you briefly about how I think LinkedIn has changed business. It’s provided a fantastic platform for every age-group to connect with each other and build a community of people, who have just enough insight to enable them to have the first conversation, do the research, or decide on what to do next. How does the CBI and its members use it? I think it’s used right across our membership in different ways, depending on the companies or the business that’s in. But it’s just a powerful tool for connecting, getting insight, understanding our customers better, and building those right sort of relationships. What do think the future is for LinkedIn and British businesses? I think the future for British businesses has never been better. We’re enjoying a tremendous rejuvenation and proliferation of start up companies, digital companies, technology companies. I think LinkedIn provides just a brilliant platform for that community to grow, develop, and expand not only in the UK but internationally. How would you say LinkedIn has changed recruitment and marketing? I think that LinkedIn in the UK has fundamentally revolutionised the way that people recruit, the way that people sell products and services, the way that internal employees engage with one another. And then use their networks as well. We’re seeing the entire talent industry transforming as a result of LinkedIn and 400 million members around the globe, 20 million in the UK today. That’s over 60% of the entire UK workforce and students on LinkedIn. People are there to do business. People are reading rich content on the platform today, and that is something that was very different when I first joined the organisation five years ago. We’re now, by far and away, the largest distributor of professional content on the web. How do you use LinkedIn on a daily basis? What’s your routine, and what are the keys to success? Firstly, have a rich profile. I use LinkedIn every morning to understand what the trends are that are taking place in the industries with which I work, either through the Pulse news app or through my newsfeed directly. Importantly for LinkedIn, it’s not always about the amount of time spent. It’s about ensuring that you can extract maximum value to drive efficiency for you and your business, to stay up-to-date on the latest trends taking place in your industry. First and foremost, have a rich profile. Make sure you’ve got a picture – you get 14 times more views on your profile with a picture. Make sure you’re showcasing your experiences, and most recently, as well ensure that you’re using the publishing platform to broadcast your message to your network and wider industry. What does the future hold for LinkedIn in the UK and globally? From a LinkedIn perspective, we recently acquired Lynda.com, the largest online learning platform in the world. And so that represents a great opportunity for our 400 million members around the globe to acquire the skills that they need to apply for jobs and have future success. We’ve also invested in our influencer program and north of 500 influencers around the world, increasingly becoming a rich content platform. One of our focuses is to ensure that every time you log on to LinkedIn we give you a relevant experience that delivers you content that’s going to help you become more productive and more successful. How has LinkedIn changed your industry? I think LinkedIn has certainly transformed the way the recruitment industry operates today. When I started this business 30 years ago, one of the biggest ambitions and motivations of all recruitment owners was to have an exceptional database. Isn’t it amazing today that we now have the world’s largest database available to us free of charge? So I think that LinkedIn itself has transformed the industry, and access to candidates has been never better than what it is today. How would you say that you use it yourself, and how does your organisation use it? There’s no question, I absolutely am an avid user of LinkedIn, because I think as an industry today, if we don’t embrace technology, if we don’t embrace innovation, we get left behind. And whether we like it or not, LinkedIn has had a transformational impact on our industry, and I would urge anybody who’s in this sector today, that you need to become a superuser. When I came across LinkedIn a few years ago, you know, I was very proactive in wanting to embrace it. Which is why I came on board as an influencer, because I wanted to share some of my ideas of what I’ve learnt over the last 30 years in recruitment, you know, with other people, effectively, on the platform. And at that time, I had absolutely no idea to the extent that that would penetrate. And here I am two years down the line, probably the most followed person in the world in the recruitment industry, and of course, that has a huge impact on my businesses and our brand within the sector. I understand that LinkedIn today is going to make an announcement where it’s now achieved a substantial milestone. So I suppose the next step for me is how do I convert the several million new followers onto my followers? So not that I want to be competitive or anything, but I think I’d like to see myself with 20 million followers, which I think will be quite an achievement. I think going forward, I think one of the biggest tasks that we have, is how I get my recruitment consultants in my organisations to use this product in a more efficient way, because technology is like a lot of things, it does a lot more than we currently use it for. So I think in order to maximise its advantages and its benefits, I’d like to see us being as an organisation and as an industry, in becoming what I call superusers. Because ultimately, the recruitment industry is all about finding talent. I have no question of doubts in my mind that the talent we are looking for is available on this platform. The question is how equipped are we and how well-trained are we in how to access that talent. Make sure you subscribe to the Employer Branding Podcast.